It's not uncommon for some part of a trip like this to go wrong. You almost have to expect it and just let it slide. My very short 2 night stay in Hamburg coincided with an approval of a current project's final version, which meant a sudden need to deliver a very large file. The hotel I booked in Hamburg had internet of course, which is pretty much a requirement for me when I travel, but they also offered a high speed option at 20euros a day. That high speed option turned out to be very very slow, which meant most of my two days in Hamburg babysitting two failed 20 hour uploads. I did manage to step out at one point in the evening to grab some food and wander for a couple hours, which is what I like to do in any city anyway, as well as wander the harborfront area during the couple hours between my hotel checkout and my train to Cologne. What I did see of Hamburg was a great mix of a city that felt somewhere between Amsterdam and Munich in style, architecture and streetlife. But now on to Cologne with hopes of a better few days. Nice pics Jon. 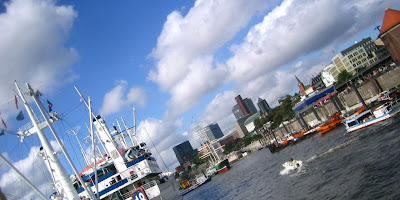 Hamburg looks beautiful. Sorry to hear about the 'large file' issue.